Typically our members are interested in our Sales Index. In November 2013, they are all talking about the employment outlook for jobs in Precision Machining. Biggest surprise- 99% of responding companies expect employment in their shops to remain the same or increase! PMPA’s Business Trends Index for November 2013 is 116, down 10 points from last month’s value, yet at the highest value we recall for November. November is typically a slow sales month due to seasonal factors. The index is maintaining an average for calendar year 2013 of 122, and for trailing 12 months of 119. November 2013 shipments are 113% of October 2012. That’s a great indicator of industry strength too! 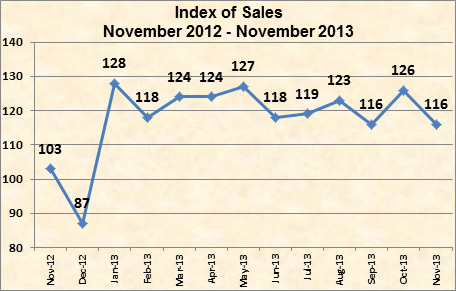 We are pleased to see that sales in November were above those in November 2012. While the last calendar quarter is historically weak for our shops, we have a nice tailwind of sales for the year to date at 122 average for the calendar year. With sales this strong in 4th quarter, we think that savvy shops will be lining up sourcing for the even stronger sales likely once we turn the calendar page to 2014. Have you been sharing expectations with your key suppliers? Get our November PMPA Business Trends Report Here. Trends in Advanced Industries- Brookings Institute. If you are at any way involved with skilled workforce or employment issues, you need this authoritative report about Advanced Manufacturing jobs in your state or metropolitan area from the Brookings Institution. Change the conversation!